This comic may seem familiar to some. It’s an updated version of the very first comic of Mike: Bookseller found on this website. I have been working on this for a while. I’ve been writing comments and redrawing the old comics for Mike: Bookseller for a real, tangible BOOK version of my comic strip. I have submitted my comics for publications in the past and have been kindly rejected or flat out ignored. Maybe an art update was what was needed? It has taken me a bit to get to this and I had hinted at this project a few times in the past. Every time I geared up for making this thing a reality something crazy got in the way. A miscarriage, a very serious family emergency, situations requiring me to go and get a second job, becoming a father. My situation again has required me to find a new second job and I’d really just want to work on more of the updates for old comics while continuing to make new comics as well. By going to my Patreon Page you’ll see updated goals, thresholds, and rewards for Patrons. For starters, you’ll get to see updates of these redrawn comics monthly, early access to the new comic strips, and more, of course. 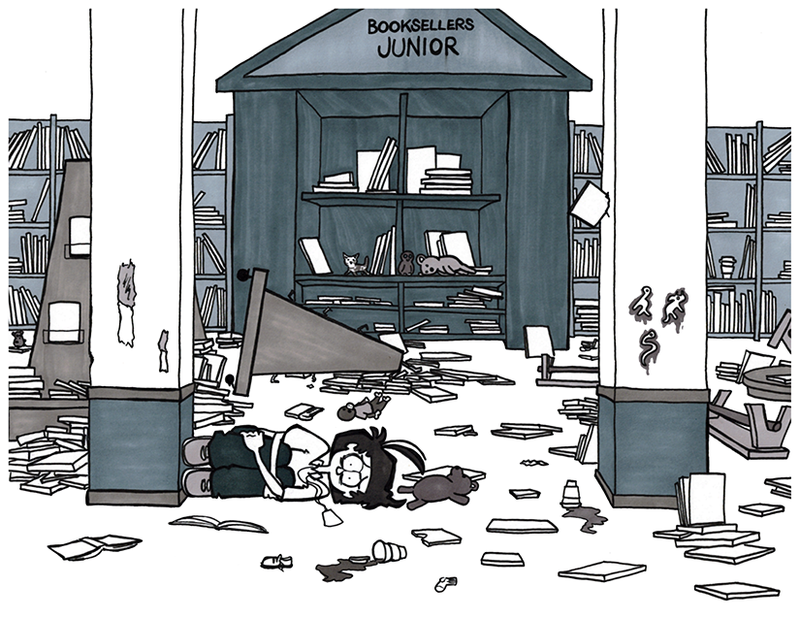 The goal has been for my job at The Bookstore to be my Second Job and for drawing comics and telling stories to be my main source of employment. I know that for many who read my comics you are also retail employees and money is scarce enough before you sign up to support someone for even a dollar a month. For you I ask for those overused words of “Like,” “Comment,” and “Share.” If enough of that happens, it’s as good as currency. Thank you all for reading my comics.